Hi. I was thinking about buying a graphics tablet to use with photoshop and Hitfilm. My hand will sometimes get a cramp when using a mouse. I emailed the customer service and they said that Hitfilm 2 ultimate may or may not work with a graphic tablet. I wanted to know if anyone has had one that works. Hey. I went ahead and bought the Wacom Bamboo Capture tablet. It works well for every thing except moving the camera in 3d space. It does take some practice to get used to it. It is so nice for color grading and saves my hand! I'd say go for it. Well worth the $100, plus you get Photoshop elements and some other programs. HF does work with a Wacom, but as noted above some features don't work (as it's only simulating a mouse - not using a custom control). This can get a bit or a pain. My Wacom is used for everything... CGI (Lightwave. Maya etc) through to Photoshop and AE... I even use it for normal Windows operation... the only program I use the mouse with is HitFilm! I just find it a hassle as it's not pad configured, so easier to stay 'mouse native' when working in HF. I've been using a pad since 1995 (!) - many flavours of Wacom and most studios I've been at run pads also. I have to say that using a mouse (for me) is very weird! LOL. Cine1080, wondering, what are the pitfalls you encountered? Erikals - basically, as HitFilmer165147 mentioned, it's really difficult to navigate the 3D space as it's set up for a mouse (middle mouse etc). So, I pretty much finish off all my other elements (ie LW or Maya renders, get my cameras/nulls exported and prep for teh comp) - then loose the pen and move over to the mouse whilst using Hitfilm. I'd rather stay with the pen, but the navigation and control isn't there really, so the 'old way' it is. I've never used a tablet, so this may be a dumb question, but if HF *did* work with a pen, how would you navigate with it? Movement makes sense, just move the pen, but how do you do other things, such as click and drag with a pen? Are there buttons on it? Is it based on pen pressure on the tablet? Just curious Have been considering trying out a tablet for a while, just haven't gotten around to it. hi, there are probably some intros on youtube that covers it. - yes, there are buttons on it, one for L or R click, one for midle click, a delete/eraser button. they can be configured as you wish. - there is no scroll button though. Thanks erikals, that helps. I didn't realize 'hovering' was supported. Looking forward to playing with one in the future. 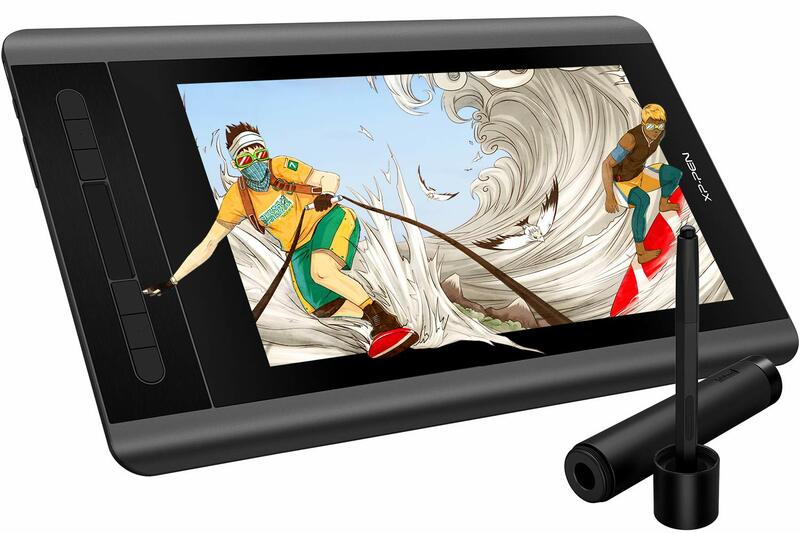 I have a XP-Pen Artist 12 Graphics Display tablet ( buy from https://www.amazon.com/XP-PEN-Artist12-Battry-Free-Multi-Function-Sensitivity/dp/B07GNK18VJ ) and use it in photoshop and illustrator but never considered it for hitfilm or any video or audio editors. Not sure what you would use it for in hitfilm other than to maybe draw motion paths, maybe. Keyboard and mouse are my main controls for hitfilm, I would think the pen would get in the way and the touch function isn't all that great on my bamboo. It works as it is suppose to but don't have any long term use for it myself. Maybe it could come in handy with the moving things around in 3D. I also have a Leap Motion hands free controller that allows to control computer by gestures and moving my hands around but I still default to my mouse and keyboard. @touyun I also have an xp-pen 13. In Hitfilm, I just use it as a second display, while using it as an illustration tool in paint programs. Is the Apple iPad Pro with Apple pencil a good option? Not sure if this is what you need. 1. The side button is only a few millimeters higher than the body of the pen -- it's almost impossible to find it by feel alone. So the fix is to take an old credit card and to cut a strip of plastic to the same size as the side button, the stick it in place with thin double-stick tape. It works very well. 2. These pens are expensive -- to make yours last longer, get some silicone pen grips/bumpers from other pens/clickable pencils, etc. -- whatever you can find, and put one at each end. They roll off the table easily -- when they hit the floor, you'll be glad you put the bumpers in place.